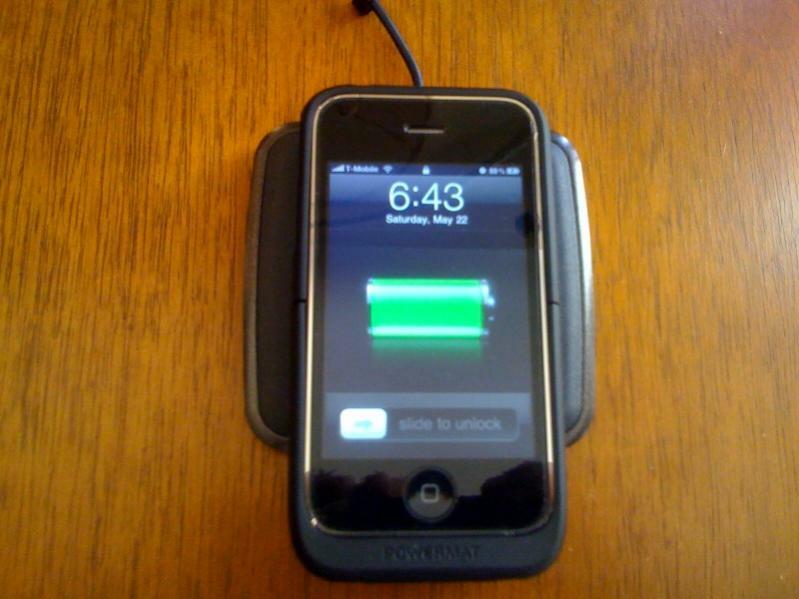 Now, Powermat (and Best Buy) offer a package that has an iPhone case AND a single-device mat for $70. It comes packaged in the standard plastic/cardboard configuration so I'm gonna skip an "unboxing". Back to the review. I personally use an Invisibleshield on my 3GS so cases are hit or miss. This case fits great! I did have to peel off the small top and bottom strips that cover the chrome for the case to actually snap together but the back, front and side pieces don't interfere at all. I installed the case in a matter of moments and am charging the phone as I type this. The kit also comes with a microUSB cable so you can sync (or charge) your iPhone with the cable or any other microUSB charger. I tested it with a Motorola brand MicroUSB charger and it worked fine a well as syncing my phone with my Mac via the included cable. The case itself is a hard case with a soft touch rubber texture. It does add a bit of bulk but I like a larger case/device due to my large hands. It feels good and seems to protect the phone better than the silicone sleeve I've been using up to this point. At $70 for both the case and the mat, I think its a pretty decent price. You get a pretty good hard case AND a way to charge the phone by simply laying the phone onto the mat. I've included a few pictures for reference. I am also ever interested in these i might have to pick up two. thanks for posting the review. OK Gentlemen/Women, Oh... you too maX. I would like to know what effect if any this device has on the internal magnetometer? Seems to me that at least it would really rattle it's cage so to speak requiring you to re-calibrate the compass every time you use it if not actually damaging the sensor. (is this charger Apple approved [never thought I would be asking that question about anything]). My concerns about the magnetometer is also one of the reasons I stay away from cases with magnetic closures. I know maX you like your iPhone naked and actually so do I but sometimes it is just plain handy to have your phone in a belt case as apposed to the front pocket of my Levis that over the years seem to have become very tight (strange but true) and when I sit down it is at best very uncomfortable having my iPhone digging into places I didn't even know I had. I'm not 100% sure but I think this charger is certified by Apple (or whatever they call it). I hadn't thought about the magnetometer but you raise a good point. Maybe Kruejl can raise light on the effects or lack thereof. I would think if Apple with their touchiness about what they approve software and hardware wise if they say it is OK it probably is. That said considering that they can lose as many "Top Secret" iPhone 4s as they appear to have I am not so sure about their control efforts. But if it is on their approved list and the it kills the magnetometer I guess it would be relatively easy to get them to replace it. The irony is I don't really use the compass but then I don't know if it is used in any of the other location (GPS) applications. OK - what do you think Mr. Kruejl? Like I said I don't really care about the compass but it would just bug me to no end if my phone was damaged regardless of whether or not I use the magnetometer function, not to mention that if I ever decide to sell it not having the Magnetometer could be a deal buster. I would like to have one of the cordless chargers just for the absolute convenience of not always having to plug the iPhone into the wall charger. Just walking into the house and plopping the phone down on the end table next to my car keys really appeals to me. Can i use it for my iPhone 4.? I believe there is an iPhone 4 version. I really enjoy the look of this case, it fits snug and had a great feel.